In our study of Luke’s Gospel, our next story reintroduces us to a guy who was feeling confused about who Jesus is. He is doubting Jesus. Jesus used to be very real to him. But now it seems that Jesus has gone away. 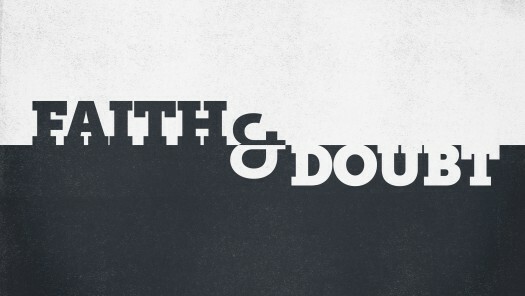 That doubting guy? You’ve met him before. Maybe you know him quite well. Maybe Jesus seems to have gone away from you too. In the story from Luke 7, the doubter is John the Baptist. He was Jesus’ relative, and he was the guy who ushered Jesus into the ministry. He had a reputation for being bold, but John has changed. Maybe a year has gone by, John has been in prison probably for months, and his doubts about Jesus start growing. John still has a couple disciples caring for his needs in prison, and he sends them to Jesus to ask if Jesus is really the One. Questioning Jesus. Have you ever done that? In response to John’s question, Jesus doesn’t say a word. Instead he does what the One was supposed to do: miracles upon miracles. Only after that Jesus tells John’s disciples, “What do you see with your own eyes? Just tell John what you see.” What did they see? They saw the manifest presence of the Holy Spirit working powerfully through Jesus to perform the miraculous deeds which would confirm that he was who he said he was. The Messiah. The Savior. The promised One. He was who months ago John said he was, the Lamb of God who takes away the sins of the World. John might be languishing in prison, and that would be terribly difficult, but Jesus’ miracles are a response to John to not give up. Jesus was doing what the Messiah was supposed to do. And as difficult as it would be to have to hear about that from a prison cell, John could still rejoice that the long awaited Messiah actually had come. Is it possible that for those of us who don’t see God, don’t feel God, and feel distant from God, we need to see Jesus differently? Jesus was right there. He was doing what he was supposed to be doing. Perhaps prison had affected John’s viewpoint. He couldn’t see Jesus anymore. He felt very distant. What about you? Don’t see Jesus? Feel distant from him? Be assured that Jesus is right there. He is doing everything that he is supposed to be doing! It is no different in our day. He is alive and well. But perhaps our expectations are wrong! So often in my own life I want Jesus to answer my prayer a very specific way. And when he doesn’t, I can get upset. I can think he betrayed me, that he didn’t show up when I wanted him, when I felt I needed him. But he was there. He was doing what he was supposed to do. It was I who needed to see him differently. I have heard this many times over the years when a loved one has passed away. We don’t want that person to be gone. We miss them. The passing is hard. In many cases we have prayed that God would heal them and prolong their lives. But our loved one dies, and we are left wondering why God didn’t answer our prayer the way we want. In those moments our faith in God can be rocked. But know that Jesus is there. He never left. Most likely we need to change our perspective of who he is, what he does, and how he should act. Like my one seminary professor Ken Miller says “we try to fit Jesus in our back pocket, as if we own him, as if he could fit there.” We shouldn’t even try. You might not be in prison for months like John, but there are plenty of other situations that have you feeling imprisoned, trapped, hopeless, and you wonder why Jesus isn’t rescuing you like you want him too. The longing and the waiting can be tiring and many times we can get to a point where we want to give up on Jesus. But he is there. He just might fit in our pocket. You might not be able to see his work in your life. You might have such a specific idea of what you want him to do, to be, to look like, how you want him to answer your prayer, get you out of a difficult situation, make life easy, peaceful, and because he isn’t doing what you want, you feel like giving up. But he is there. Right in front of you. Doing what a Messiah is supposed to do. He hasn’t left. You just might need new eyes, a new heart, a new mind to see him. So hang in there. Stay strong. Pursue him. Ask the Lord to open your eyes to him, to see things the way he does. He is the miracle working God. He brings new life. He wants to transform our hearts.